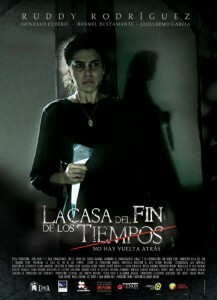 The House at the End of Time is one of the most inventive supernatural thrillers to come along in a while – an impressive, confident and creepy debut from Venezuelan writer-director Alejandro Hidalgo. This fresh voice in the genre adopts many of the usual genre tropes, however, he crafts them in a relentless, meticulous manner to serve a story that is full of shocking twists and turns. The film doesn’t waste any time either. In the first 10 minutes it effectively manages to provide two solid jolts involving leading lady Ruddy Rodriguez (as “Dulce”) who awakens on the floor of her home bleeding and surrounded by shards of a broken mirror. Moments later, we find Dulce being arrested for the murder of her husband and son. Flash forward 30 years later and Dulce is an elderly woman being released from prison but who is under house arrest in the very home she supposedly committed her crimes in. Bittersweet memories of her life in this house begin coming back to her and Hidalgo competently juggles past and present story lines. In the present, Dulce (Rodriguez in decent old age make-up) is a cynical woman devoid of her faith in God. She’s visited regularly by a priest who attempts to bring the joy of God back to her house while, at the same time, get to the root of the murders. In the past, Dulce is a woman married to Juan Jose and a mother to two boys, Rodrigo and Leopoldo. They live in a atmospheric home we come to learn had been abandoned for years but was made available to a family in need by the government. Juan Jose, a flawed man trying to make ends meet, buys the house at a bargain to care for his family. Hidalgo brings a lot of warmth and care to these characters. And, he revels in a bit of an Amblin-esque vibe when spending time with Leopoldo and Rodrigo, but this is Dulce’s story, really, and Rodriguez delivers a solid performance. I don’t want to risk giving away too much about The House at the End of Time‘s plot, so I’ll leave it at that. It’s a film loaded with various shades – love, loss, nostalgia, hope and they all come to a head in the eponymous abode. The film has a tremendous share of really successful fright sequences and there’s a scene with a séance throws it audience into complete darkness and relies only on sound. I wish it was longer, though.